We’re in the midst of our version of the Letters to the President project right now. My students are too young to partake in posting to the site, but wow … I think I saw there are nearly 2,700 letters at the site already. What a rich resource of student writing and ideas! My sixth graders have had lesson on the Electoral College (an eye-opener to them, who thought the candidate with the most votes wins the election) and worked on a short essay on whether voting should be mandatory or not. We’ve read articles and watched some videos. Yesterday, I had them set up a Research Journey in Google Docs and showed them the Research tool inside of their Doc. Today, they will determine a topic for their Letter and start diving into some websites to be informed when they start writing (and hopefully, podcasting). And in-between, we had them work on a Political Button (via Make Beliefs Comix) in which they had to invent or use an imaginary candidate and create a catchy button for their candidate. We talked about phrases, rhyming and loaded words. Some of their buttons were very funny. It was a nice creative break from the serious talk of our country’s future. 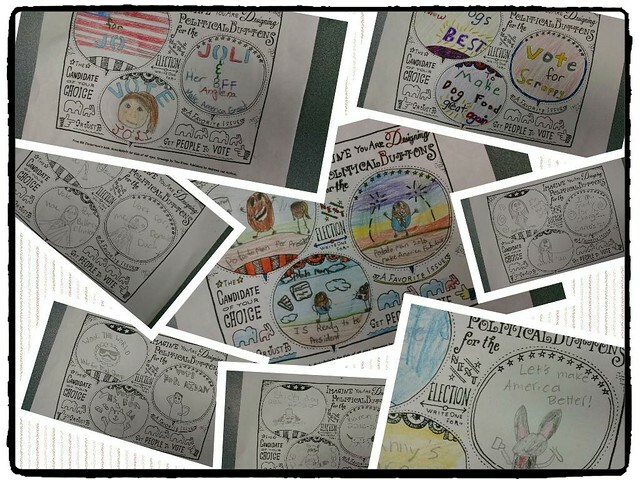 This entry was posted in 2NextPrez, comics, my classroom. Bookmark the permalink.